Understated to the point of being near-invisible, Surfside Spirits and Deli in Kihei has no need to fly so low under the radar. 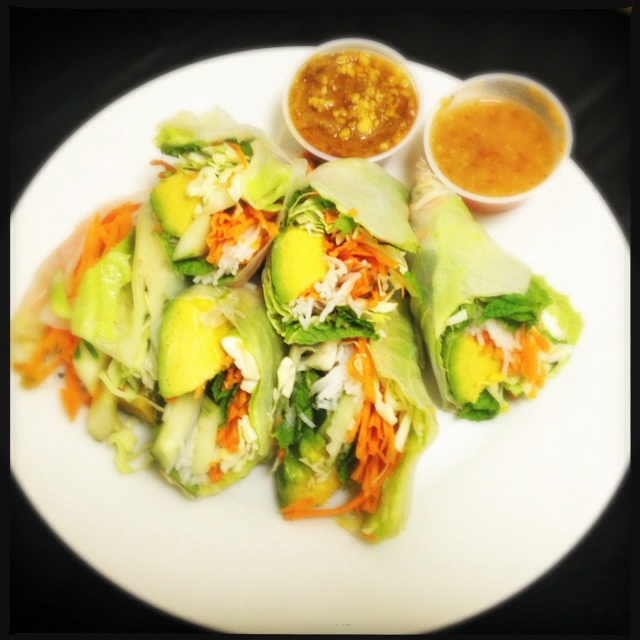 Rather, this stealth bomber of plate lunch purveyors deserves a loud, proud and regular spot in your rotation. Beyond offering breakfast, lunch and dinner, there’s an awful lot going on in this tiny space: the cafeteria-type restaurant with dining area, collectible dishware shop, post office and – presumably from the name – retail alcohol sales. Quite frankly, we didn’t notice any spirits… unless they mean the supernatural kind. We didn’t personally witness any such paranormal activity, which is probably a good thing: a poltergeist could do some real damage in this place, what with all the vintage Fiestaware. 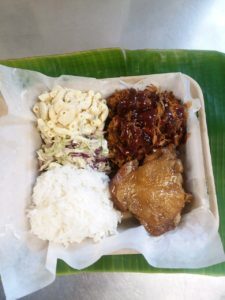 After paying your respects to any apparitions of the undead, step up to the counter, see what’s in the trays and make a selection from a variety of traditional breakfast items and Hawaiian comfort food. 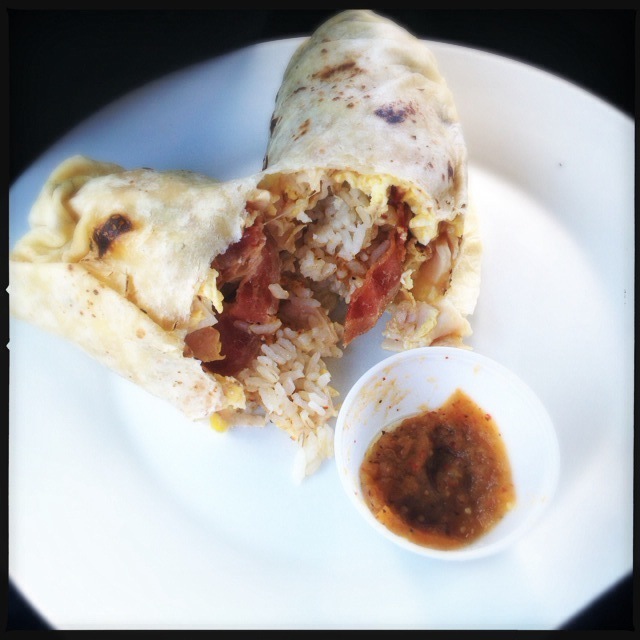 The Breakfast Burrito ($7.95) is chockablock with scrambled eggs, giant chunks of bacon.. and a lot of rice. Rice in a breakfast burrito? It’s not on the menu and we bristled a little at first sight, but hold your fire: it works. To be frank, we couldn’t really detect any cheese and the ham had more the look of turkey lunch meat… but it all comes together like Chef Hugh Acheson’s eyebrow. This Hindenburg of breakfast wraps is accompanied by a scanty portion of fresh salsa. 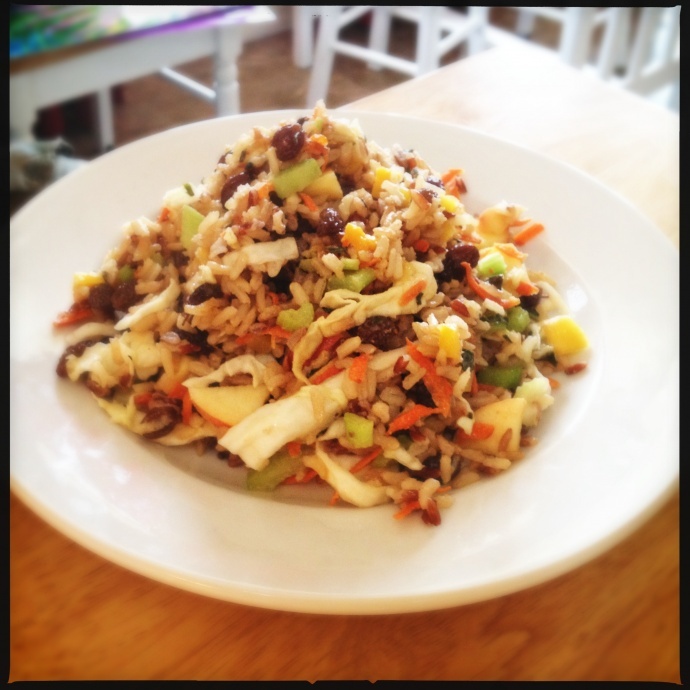 Demand more, as it adds some uplifting sparkle to the somewhat heavy flavors. The incredibly nice owner informed us that lunch is ready as early as 9 a.m. Note there’s an unstated ending to that sentence – “…and sells out fast” – a tip we pieced together the hard way. Still, we managed a taste of the Mochiko Chicken ($6.95). Heavily breaded, deep-fried bits of thigh coated in a sweet and savory sauce, it’s the junk food of standard plate lunch offerings and Surfside’s version is crispy and delectable. The Shoyu Chicken ($6.95) was hands down the best thing we tried. 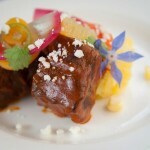 Featuring rich, savory and deeply marinated thigh meat, the preparation is simple, yet exceptionally well done. Brave the risk of seeing a ghost for some of this bird. Every day there is a different special and we made a special trip to ensure we got our fair share of the Chicken Luau ($7.95). 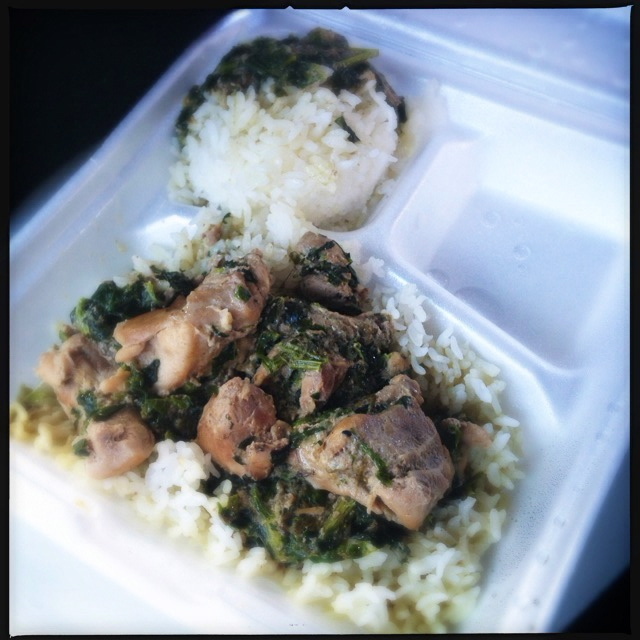 Tender chunks of chicken and what seemed to be spinach rather than luau (taro) leaves – a sanctioned interpretation of the dish – come together in a rich, savory coconut sauce. The subtly sweet gravy seeps into the mushy rice, resulting in a flavor reminiscent of khao neeo mamuang (Thai sweet sticky rice). 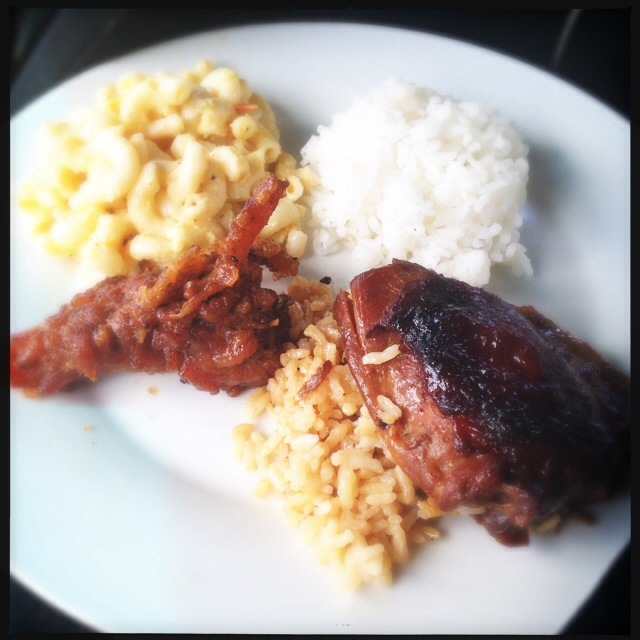 The plate lunches come with your choice of green or Mac salad. Our macaroni salad was rather salty on two different occasions. Otherwise, expect a predominant pickle flavor as well as the welcome and uplifting presence of onions and celery. Three different people helped us over three visits and all were notably friendly and cheerful. The space is small and (as mentioned) crowded – don’t go there expecting breathtaking ocean views or a proposal-worthy romantic ambiance – but the vibe is nothing if not welcoming. 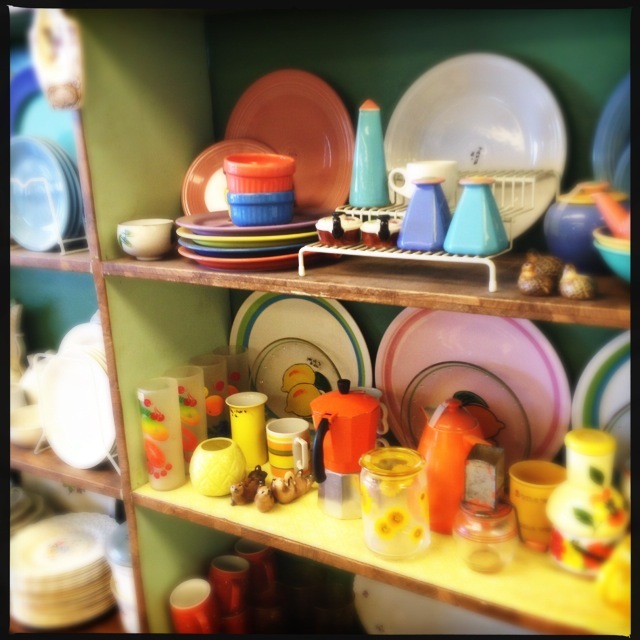 If you’re not digging the tour down 60’s dishware lane, take your meal across the street and there’s all the beach you can handle. You’re not there for white table cloths anyway. Those not so accustomed to local delights will probably find the Roast Pork ($7.95) a notably familiar and safe place to start. Homey, tender and covered in rich gravy, this dish takes us back. 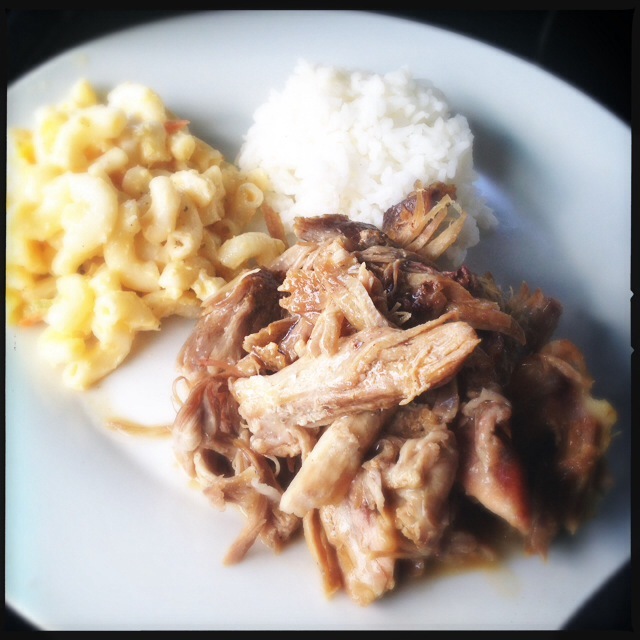 We weren’t raised in Hawaii, but pork seems to be the common denominator of invaded nations and the flavors presented in Surfside’s comforting dish transport us straight into our deceased Czech grandmother’s kitchen. Throw in some soap opera background noise and the smell of Elizabeth Taylor’s White Diamonds and its a veritable time machine. Whether you’re in the market for value, flavor or nostalgia, Surfside Spirits and Deli is likely to prevail. 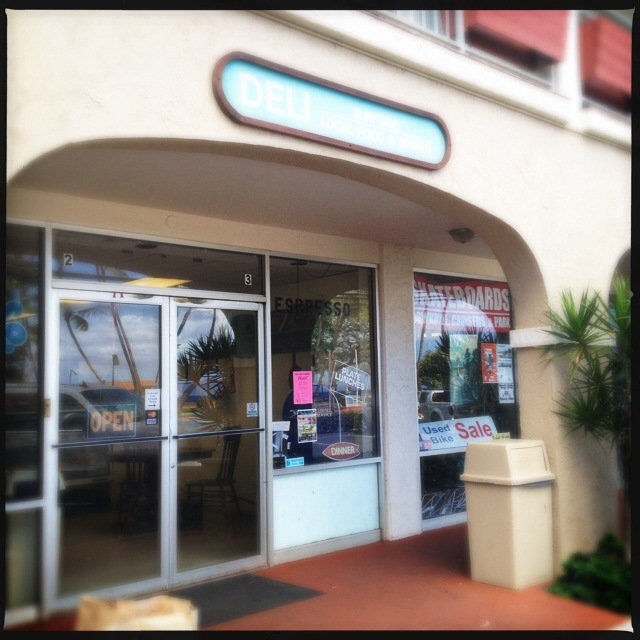 Surfside Spirits and Deli is located 1993 South Kihei Road. 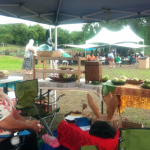 They are open Saturdays and Mondays from 8:30 a.m. to 2 pm. and Tuesday through Friday from 7:30 a.m. to 8 p.m.